The Hampton Inn of Sedona, AZ is located off I-17 on Hwy 89A, nestled amongst the breathtaking scenery of red rocks and canyons. Area attractions include art galleries, state parks, national forests, swimming, fishing, biking, trail riding, cowboy cookouts, custom jeep tours, hot air balloon rides, shopping, a replica of an 18th century Mexican village, golf, and natural water slides. Within a short distance you can dine at Chinese, Japanese, ''Cowboy'', Italian, Indian, Greek, among many other restaurants/lounges. 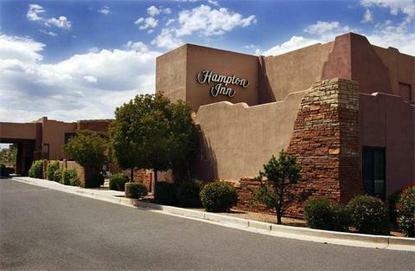 Hampton Inn Sedona offers a deluxe complimentary breakfast WITH HOT ITEMS We feature 56 rooms, interior corridors, whirlpool spa, on-site tour booking, safe deposit boxes, outdoor pool, and meeting room for up to 40 people. Amenities include complimentary continental breakfast buffet, in-room coffeemaker, iron, microwave, refrigerator, and Television with cable package. We also offer connecting rooms and cribs, when available. Rollaway beds, meeting/banquet facilities, and laundry/valet services are available for a nominal fee.